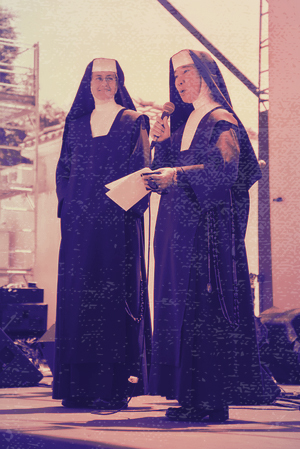 1531 Folk Fest Music and Arts Festival is a celebration of the Good, True, and Beautiful, and a meeting place for Catholic artists throughout Southern California. Are you a musician? We invite you to share your talent with us during our open mic hour! * We will have craft, music, and drama workshops throughout the day, or just come and sit back and enjoy the music under a canopy of sycamores trees and starry skies. * Please pre-register by sending an email to hopemaryschneir@gmail.com with name and song title, confirmation email will be sent. CONTACT US TO MAKE SPONSORSHIP ARRANGEMENTS! Change a life - help send a kid to camp - DONATE! - every dollar raised helps keep the prices LOW and for those who could otherwise not attend- closes the gap. CONTACT US TO RESERVE A BOOTH AT THE EVENT! To reserve a space to promote your business or cause, please click the link below. What is the 1531 number about? On the morning of December 9, 1531, a native Mexican peasant named Juan Diego saw a vision of a maiden at a place called the Hill of Tepeyac, which would become part of Villa de Guadalupe, a suburb of Mexico City. Speaking to Juan Diego in his native language, the maiden identified herself as the Virgin Mary and asked for a church to be built at that site in her honor. This apparition began the greatest era of evangelization in world history. What is the price of admission to the festival? The event is completely FREE! Thanks to the generous support of our volunteers, sponsors, and benefactors, there is no charge for admission to the festival. We recommend you bring a few bucks to purchase food and drink, but all the concerts and activities are free of charge. The money that we make for this festival goes directly to the scholarship fund. If you'd like to donate money, please see the donate section of the page. Your support of the 1531 Folk Festival and Compostela Campout allows us to underwrite the costs of the campers encountering financial hardship. Thanks for your support to continue this service. All are welcome at the festival. There will be food for sale including a street tacos, craft pizza and more. We will also be selling beverages including beer and wine. No outside food is allowed. Is there an option to spend the night at the retreat center? Yes, there is! If you want this to be more than just an all-day event, check out our Compostela Campout page where you can bring your RV, pitch your tent, rent a cabin for the whole family or share with friends. The festival is an outdoor event. It tends to get cooler even in the summer evenings so please be prepared with layers. The concert will be held on a patio area but be prepared to be walking down dirt roads. We love how the rustic feel of the retreat center makes you feel like you're getting away but please make sure to wear the right shoes. There are TONS of different ways you can help us ‘Spread the Word’ for the 1531 Folk Fest. Come to the festival and bring all your friends! 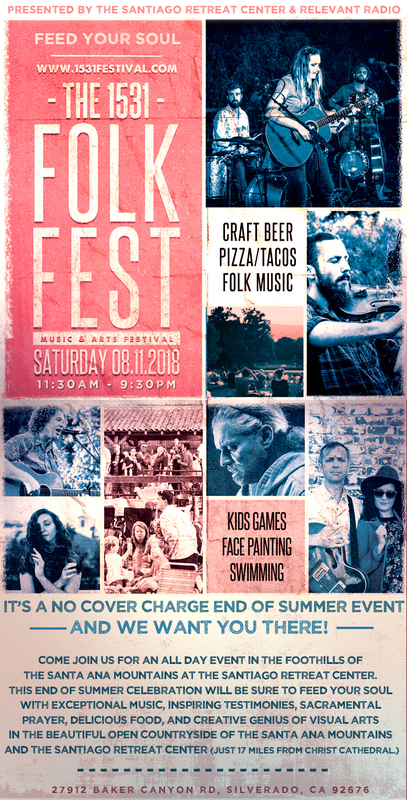 Sign up to be on our ‘Folk Fest Street Team’ (passing out flyers at your church, speaking with your pastors and minister to get them talking about the event!!) - Shoot us an email so we can give you access to the social media photos and flyer. contact us. Flyer and Poster pass out! Help us get 1531 Folk Fest flyers and posters in every restaurant, store, workout facility, community centers, church and house in the area! Like and share the 1531 Folk Fest on all of our Social Media outlets. Email your family and friends about the Foothill Folk Fest! Helping us spread the word is super easy and a great way to support the 1531 Folk Fest! Help us out today! You can help through your prayers, financial support, and by volunteering. Please consider volunteering yourself or your group to assist in set-up and/or clean-up to make the festival the Catholic highlight of your summer. For more information on volunteering please use the contact section below. Thanks helpers! Where are we expected to park? Can we bring blankets, lawn chairs and sun umbrellas to the event? Due to safety, please only bring yourselves. We will provide chairs for seating. Is there drinking water available at the festival? Yes, there is bottled drinking water for sale and you can also bring your own unopened bottled water to the park (please no glass bottles). Hand wash stations are also located throughout the festival grounds. What recreational options does the festival offer? So glad you asked! We will have field games, face painting, pool time, hiking and more! For the adults, we have presentations about the history of evangelization in the Americas and we have a tour of the Shroud of Turin going all morning. Find out about the Shroud here: Found out about the shroud center here. Please see the list of all the activities on our Compostela campout page.